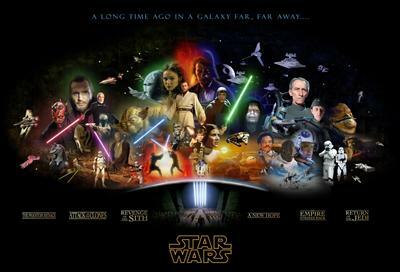 A long time ago in a galaxy far, far away... someone with the Photoshop skills of a Jedi Knight decided to create one Star Wars image to encompass an entire saga. The result? A desktop wallpaper we've only ever been able to dream of! As fantastic as the image is however, I did think of a few things I'd want changed. Darth Vader could be a bit more prominent and though Obi Wan makes an appearance as the younger Ewan McGregor, surely Alec Guinness needs to be involved somewhere? R2D2 has got to be feeling left out too, seeing as he's saved just about every other character at one time or other, he'd have hoped for a bigger presence in this poster. Still, I can't complain. It's now my wallpaper of choice! I've not downloaded the large version as i'm on a horribly slow connection and haven't got my laptop with me anyway. Your comments do sound justified though. Haha cool, yea a few characters left out. That is pretty damn cool! And a good idea, I might see about making myself one of those…it'd look great next to my trapdoor poster!